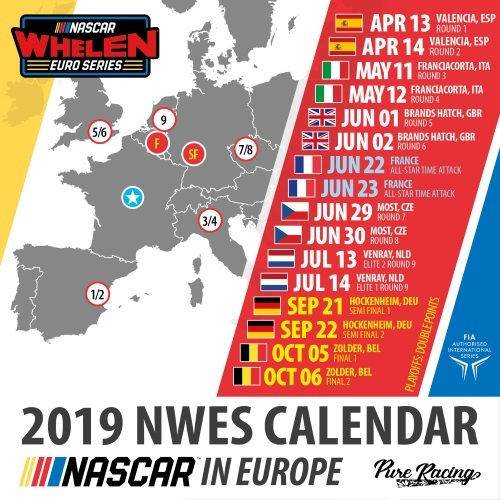 Nicholas Risitano (#8 Racers Motorsport Chevrolet Camaro) took his maiden NASCAR Whelen Euro Series win at end of a vibrant ELITE 2 Round 2, holding off a very strong Andre Castro (#24 PK Carsport Chevrolet Camaro) after a late restart. 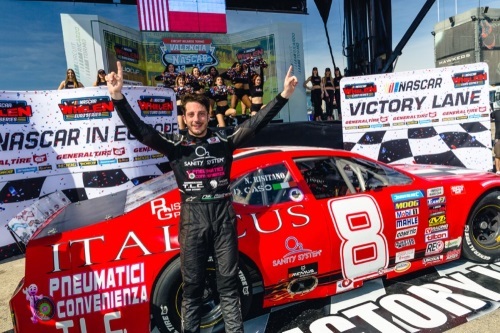 The Italian was impeccable in fending off every attack grabbed his first ever win in the NASCAR Whelen Euro series. 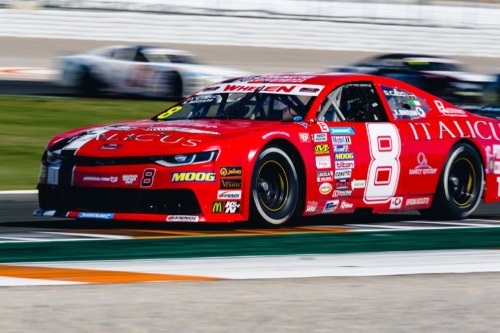 Risitano carved his way to the top after starting fifth in the second ELITE 2 race of the 2019 season. The 31-year-old Italian took advantage of the intense battle for the lead ahead of him between Myatt Snider (#48 Racing Engineering Ford Mustang) and Castro to position himself perfectly and grabbed the lead on lap 8 of the 15-lap race, keeping it until the checkered flag. After leading the first 7 laps, Snider ended up sixth. The NASCAR Gander Outdoors Series Rookie of the Year and Castro once again put up a spectacular battle that lasted seven laps. After having to surrender the lead, Snider ended up sixth under the checkered flag. Saturday’s race winner Giorgio Maggi (#50 Hendriks Motorsport Ford Mustang) was seventh ahead of Pierluigi Veronesi (#27 Alex Caffi Motorsport Ford Mustang), Justin Kunz (#99 Dexwet-Df1 Racing Chevrolet Camaro) and Jerry De Weerdt (#78 Braxx Racing Ford Mustang), who closed the top-10. The Belgian won the Legend Trophy ahead of Mirco Schultis (#70 Mishumotors Chevrolet SS) and Michael Bleekemolen (#69 Team Bleekemolen Ford Mustang). 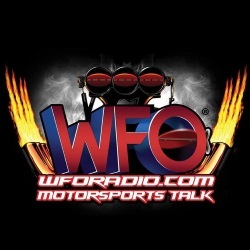 Arianna Casoli (#54 CAAL Racing Chevrolet SS) won the Lady Trophy by edging NASCAR Gander Outdoors Truck Series team owner Jennifer Jo Cobb (#10 Racing-Total Chevrolet Camaro). The American was finally able to join the ELITE 2 grid on Sunday after the Racing Total team worked all night to put the #10 Chevrolet back together following her teammate’s crash in practice. 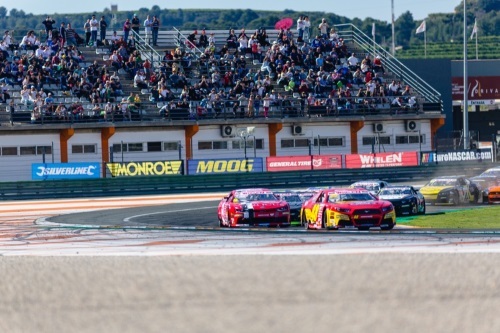 The ELITE 2 Division will return to action in four week’s time at the Autodromo di Franciacorta in Italy, on May 11-12. All races will be streamed live at Fanschoice.tv, the Euro NASCAR Youtube channel and Facebook page, Motorsport.tv and a vast of websites and social media pages around the world.